In 2007, the North Dakota State Legislature created the North Dakota Pipeline Authority to assist development of pipeline facilities to support energy-related commodities. There are more than 30,000 miles of gathering and transmission pipelines in North Dakota. 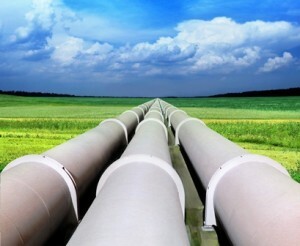 The United States has the largest network of pipelines in the world. North Dakota makes use of product pipelines, crude oil pipelines, natural gas pipelines, and a carbon dioxide pipeline. Several additional pipeline projects to transport the increased oil and gas production in the state have been proposed or are in the planning stages. The North Dakota Pipeline Authority provides a great resource of maps of these pipelines. Most of the North Dakota oil is transported via pipeline and rail, and the remainder is used in the state at Andeavor Refinery or trucked to Canada to be transported via pipeline. Transportation of Williston Basin crude oil changes rapidly depending on the Brent – WTI (West Texas Intermediate) price spread.